Bosman, McKenna Unveil Student Senate Election Reform Proposal | The Gettysburgian. 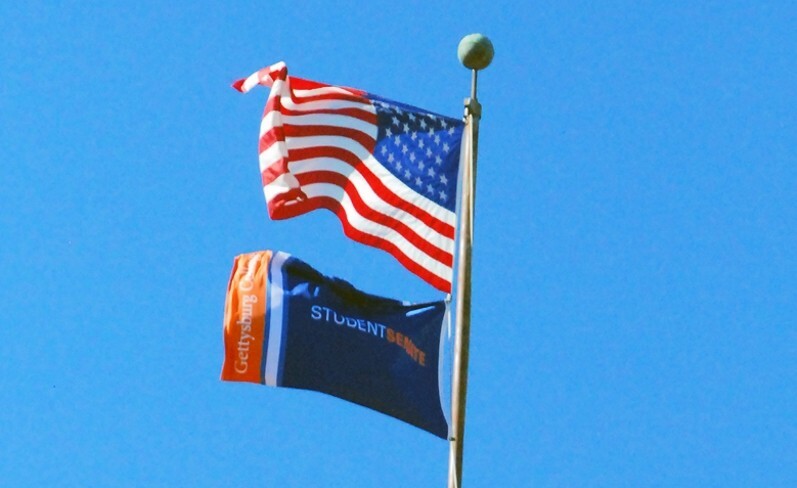 The composition of the Gettysburg College Student Senate may look significantly different next fall than it does in its current form. At Monday evening’s Senate meeting, Vice President Aimee Bosman ’18, who chaired an ad hoc committee that met throughout the fall semester to discuss issues with Student Senate elections, review 15 other colleges’ approaches to student governance, and propose changes to the Senate Constitution to reform Gettysburg’s procedures, presented her findings along with Senate Parliamentarian and Policy Committee Chair Pat McKenna ’20. Among the more consequential proposals would be the restructuring of the body from its current composition — seven senators from each class plus six members of the executive board — to a composition in which each class has four senators, then seven senators are selected at large from candidates who were not among the top four in their class, and finally voting members would be chosen from seven newly-formed affinity groups that would be composed of each of the Senate-recognized clubs. The affinity group model would provide a voting voice to clubs, who have consistently bemoaned a lack of representation, without diluting the role of a senator, a document prepared by the ad hoc committee argues. “Club reps really do represent the entire campus,” Bosman said Monday evening. Each of the Senate-recognized clubs would be placed in one of the seven affinity groups, which the committee proposed would be: Academic, Political, Religious, Service, Social, Arts & Music, and Cultural. These affinity groups would then each elect a voting representative whose vote counts the same as a senator’s. In total, the new structure would create 30 voting members, eliminating the right of executive board members to vote, and maintain the president’s prerogative to veto and the vice president’s prerogative to break ties. Additional recommendations from the committee include moving voting in Senate elections from CNAV to a Google Form and having polling stations around campus during the week of voting, holding a forum at a Senate meeting in March (prior to the April election) for executive board candidates to answer questions on their campaign platforms, and requiring each candidate to submit a 250-word statement of purpose, which will be publicly available to the campus community. Moving forward, the proposals will require amendments to the Senate Constitution. The Senate Policy Committee, chaired by McKenna, will spearhead the effort to identify what needs to be amended and draft new language to implement the recommendations. McKenna repeatedly emphasized the need for people to come to the committee’s meetings, which occur Thursdays at 5:15 p.m. in the Senate’s Plank Basement Office, to help draft that language. “We want to have these [recommendations] in place for the elections this coming year,” McKenna said. Elections typically occur in early April, but can be adjusted at the discretion of the Senate Vice President. McKenna hopes that will not be necessary. For more discussion on the proposed changes, listen to this week’s episode of “On Target,” The Gettysburgian’s weekly news podcast.